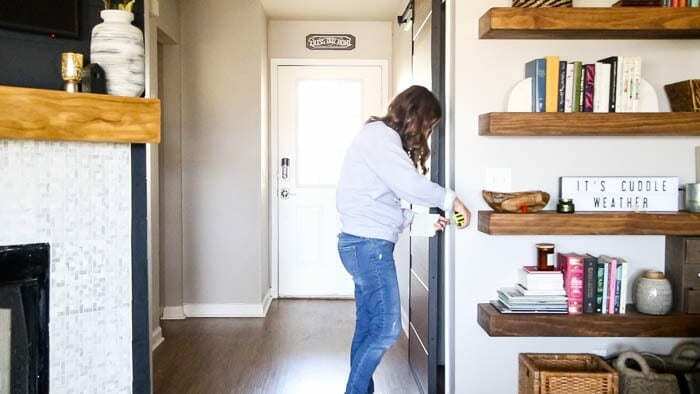 Today, I’m sharing how to install beadboard paneling – we used it in our entry for a recent makeover, and the transformation is pretty incredible! This post is sponsored by Mohawk Finishing Products. When we moved into this house, I was so excited to have an actual entry space. In our old home, the door opened right up into the living room, so to have an actual dedicated space for an entry was really fun. I even rounded up a few ideas for a beautiful entryway to get my creative juices flowing. We’ve lived here for over a year now, and so far all I’ve done for the entry is build a DIY console table and install a barn door. Oh, and after installing the door, we quickly realized it made the entry table unusable, so that brought me back to square one. Empty, boring, and dark (even with the added window, the space always felt dark and gloomy). 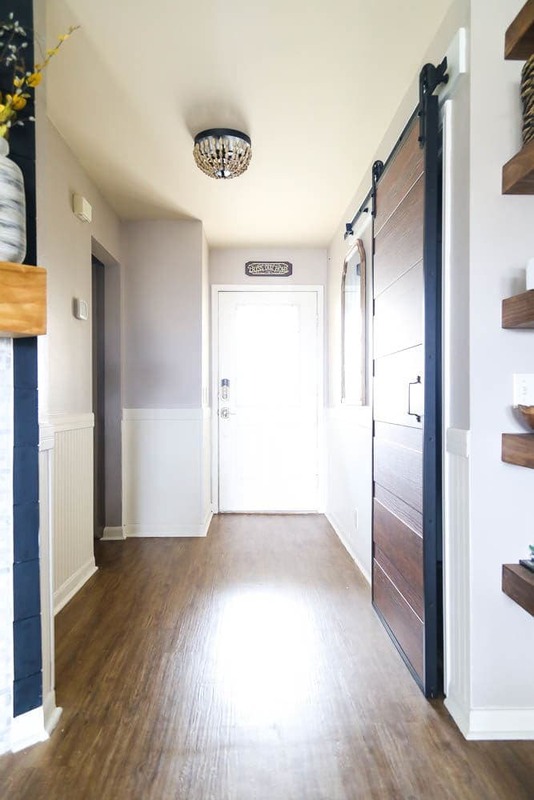 Well, last week I finally tackled a project we’ve been talking about for months and I added beadboard paneling to our entryway. The entry finally feels complete, and I smile when I walk through the door every day and see it! Today, I’m going to share all of the details of how to install beadboard paneling in your home – and (surprise!) there’s also a video tutorial! I told you I was taking this whole video thing seriously this year. As always, I’ll include some DIY details below for those of you who’d prefer to read, but the video is a great way to see the process! Note: If you’re reading this in a feed reader, you may need to click over to the blog post to see the video. First up, you’ll want to measure each wall in your space to determine how to cut your beadboard. You can go ahead and install and full panels of beadboard, but my space was small enough that I was only able to install one piece without making any cuts. After measuring, use a circular saw or table saw (I used my circular saw – click here to learn how to use one!) to cut the beadboard down to fit in the space. If you have any outlets on the wall, you’ll need to make cuts for them too. The video shows a little more closely how to measure and mark for those cuts, but basically you’ll just measure where to make the cut, then make your marks on the back of the beadboard. I used my jigsaw to cut the hole for the outlet (I’ve got a tutorial for how to use that too!). 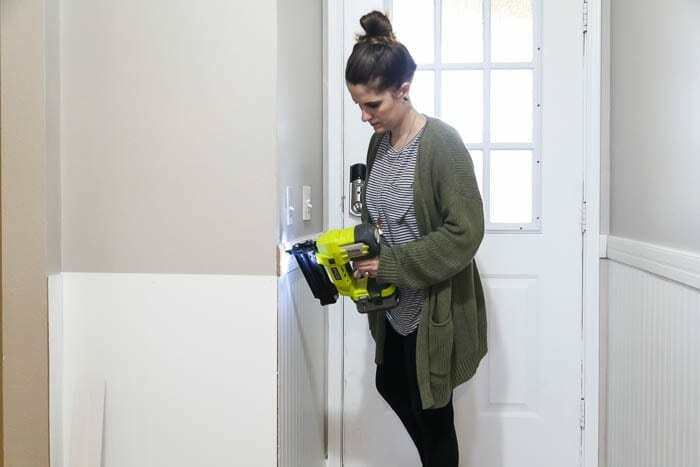 To install the beadboard, simply apply a bit of construction adhesive to the back, then use your brad nailer to nail it to the wall, resting on top of your baseboards.. Be sure to check that the beadboard is level as you work – you can’t always trust that your floors (and the baseboards) are level! After your beadboard is installed throughout the room, you’re ready to trim it out. We grabbed a piece of wall trim from the hardware store (it has a little notch on the back, perfect for resting on top of the beadboard to ensure it’s level) and used that along the top of the beadboard. I didn’t use construction adhesive for this part, just nailed the trim pieces directly to the wall. After the top trim pieces are installed, it’s time to move on to the corner pieces. These help hide the seams and inevitable gaps in the corners, and make everything look significantly more polished. Now, you’ll have some holes from the nails in the beadboard and trim, and you also may have some gaps in the seams along the top and bottom. This is one of the most important steps for a finished-looking project, so don’t skip it! I used Mohawk Finishing Products’ Patchal Putty to patch all of the nail holes on this project. It was way easier than using caulk, and creates a more finished look. The best part of the Patchal Putty is that it’s pre-tinted to match whatever you’re working on, so you actually don’t have to paint it afterwards at all! I needed to paint this beadboard regardless, but my favorite thing is knowing that if this gets dinged up over time and needs some touchups, I can just grab the putty and patch it without having to bust out my paintbrush. To apply the Patchal Putty, all you need to do is get a bit on your finger and spread it over the area you want to patch. You can wipe off the excess with a lint-free cloth or with the flat edge of a plastic card. 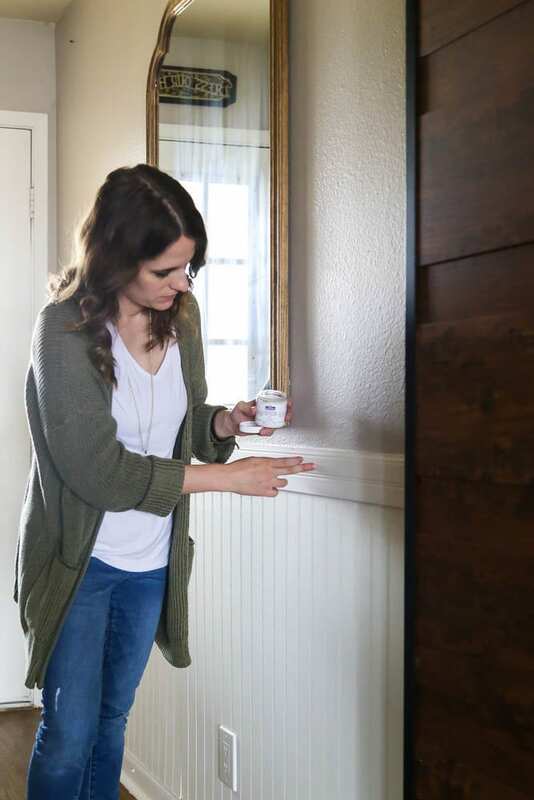 Patchal Putty can also be used on stained wood – so, it’s great for anyone with wood floors that may be scratched or dented and would also work well with a piece of furniture that needs some love but you don’t want to completely refinish. They have tons of different colors, so be sure to check out their website for more on the putty! It’s so versatile, and was the perfect solution for this project! After applying the Patchal Putty to all of my nail holes, I also applied some caulk to the seams along the top and bottom of my beadboard. Once everything is cured, you’re ready for the final step. This is the part of the process that will take everything from looking dingy and not-quite-right to absolutely gorgeous. 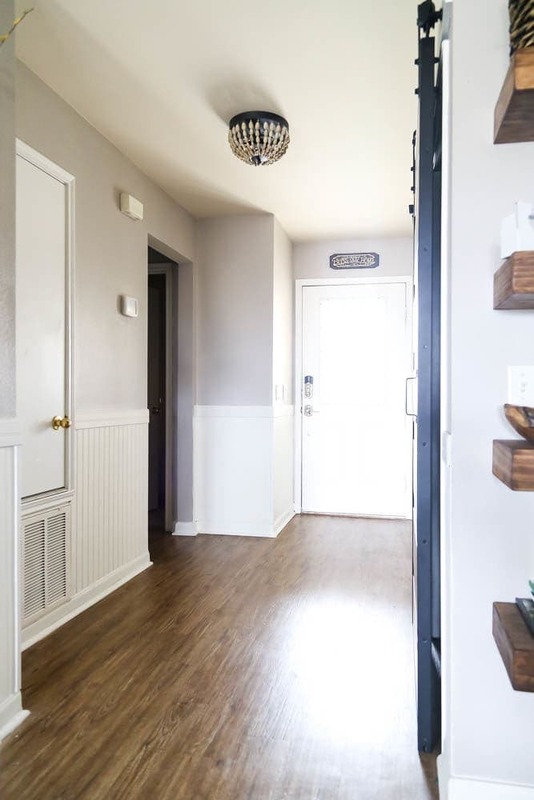 I used some leftover white paint from my bathroom to paint all of the beadboard, along with the baseboards (which were looking pretty grungy). After the painting was finished, I put a few finishing touches on the entry. We installed a new overhead light, I replaced the outlet and light switches with more updated versions (per my 2019 goal to wrap up all of these little loose ends in our house! ), and I hung a new – gorgeous – mirror. I’m so excited to have an entry that makes me smile when I walk through the door, and it finally feels like it really goes with the rest of our house. 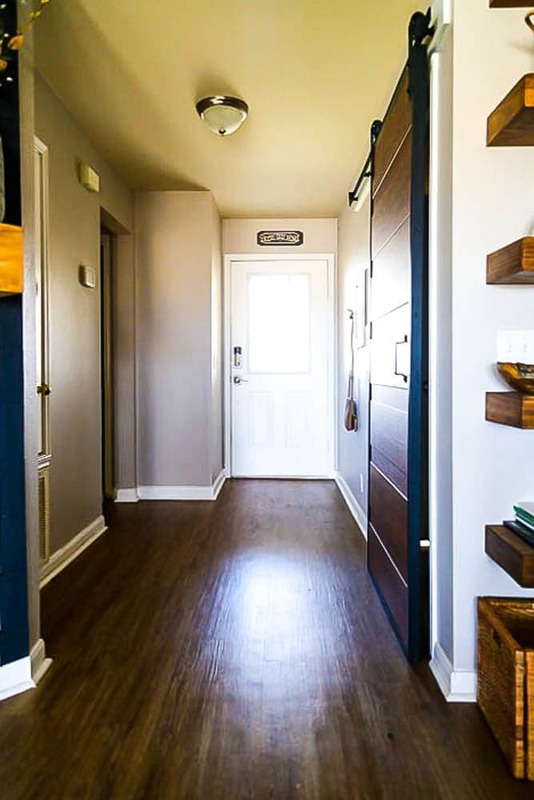 Eventually, I’d like to carry the beadboard into the little hallway that leads to the boys’ rooms, but it’ll involve a ton of small cuts (there are 5 doors in the tiny hallway, so it’s very little wall space), so I’m gonna be putting that on the back burner for now. 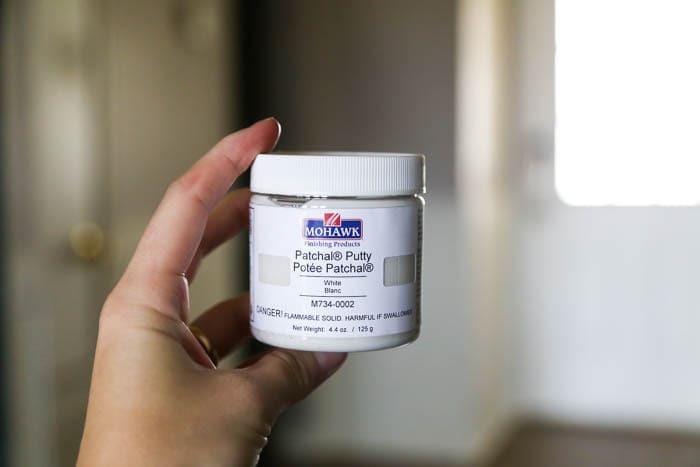 If you want to learn more about Mohawk Finishing Product’s Patchal Putty, just click here. 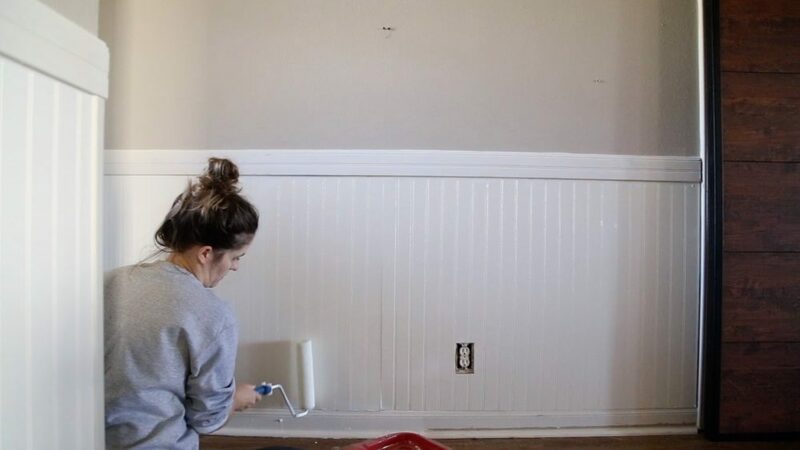 It’s perfect for projects like this, or for fixing dents and dings in wood furniture! It’s really one of those products that would be very handy to have in the house at all times, just in case you need it. Plus, you know I love a solution that saves me a bit of time – no painting afterwards! 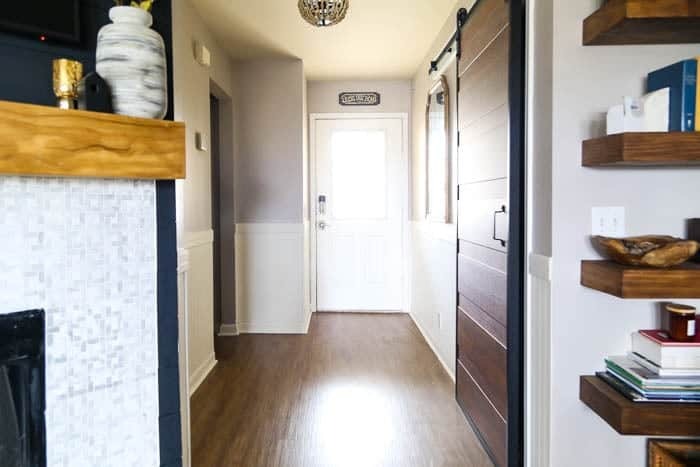 I like the beadboard walls you put up but I’m interested in what appears to be a sliding door on a track in that area. Is that indeed what it is ? Can you send a picture ? Hi Virginia – it’s a barn door! You can see more details here. I get why the console table didn’t work behind the barn door, but why not have one on the other side of the hall, under the thermostat?